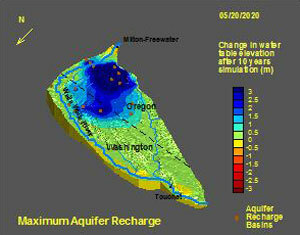 GSA hydrogeologists, in conjunction with the Walla Walla Basin Watershed Council and Oregon State University, have applied a basin-scale surface water-groundwater model to assess the potential benefits and limitations of shallow aquifer recharge in the Walla Walla Basin. 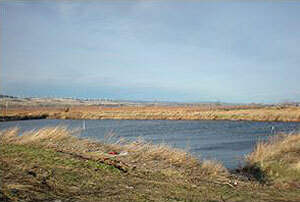 This involves diverting water from the Walla Walla River into excavated basins where it percolates into aquifer storage. Currently three recharge sites are in operation. The basin has seen a long-term decline in water table elevation coupled with endangered fish populations. Aquifer recharge is being implemented as a means of stabilizing the water table and supplementing groundwater supplies for irrigation. This reduces demand on surface water during low flow periods, thereby improving fish habitat by increasing flow. 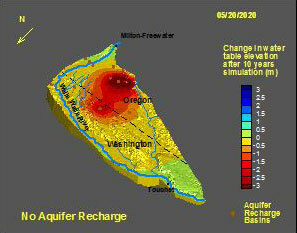 GSA is using modeling to predict the distribution of groundwater with varying recharge strategies so as to optimize recharge basin locations. Model results inform a management strategy for building seasonal aquifer storage while increasing annual low flows in the Walla Walla River.